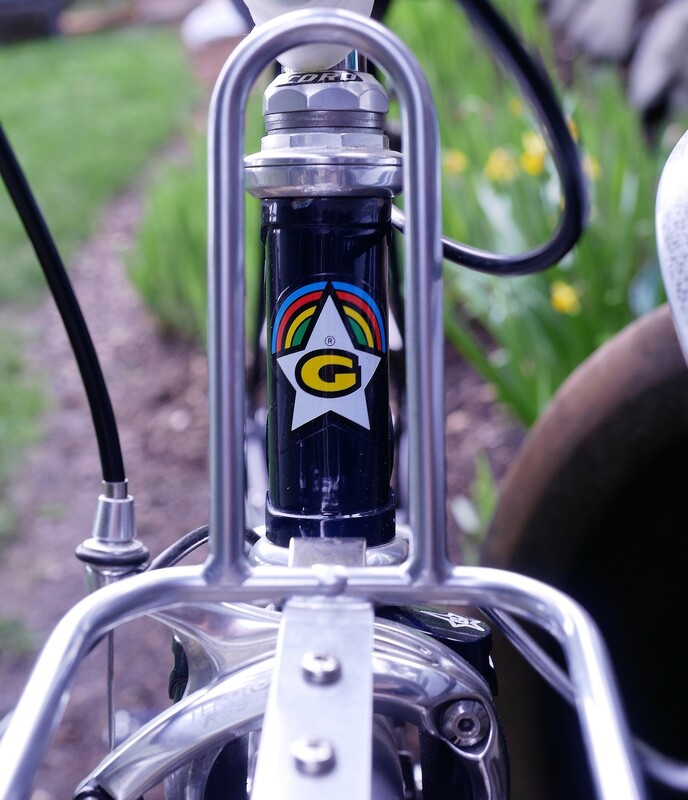 Whenever I ride my 1980’s Guerciotti I am amazed at its performance. It is more responsive and faster than any of my other bikes, some of which are no slouches in the performance department. The only reason I don’t ride this bike more often is that 650c tire sizes are limited to fairly narrow widths, and given its racing heritage, it can’t (and doesn’t want to) haul a bunch of stuff. 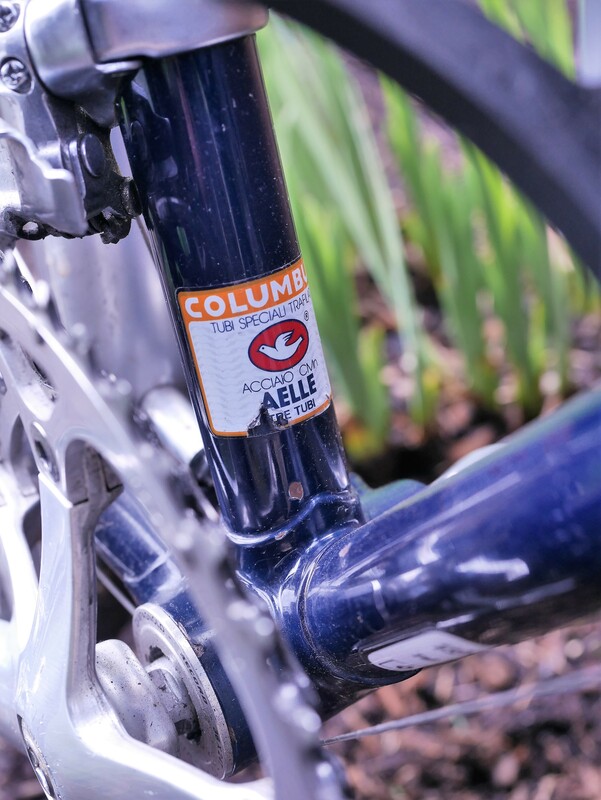 The frame is built with Columbus Aelle tubing. 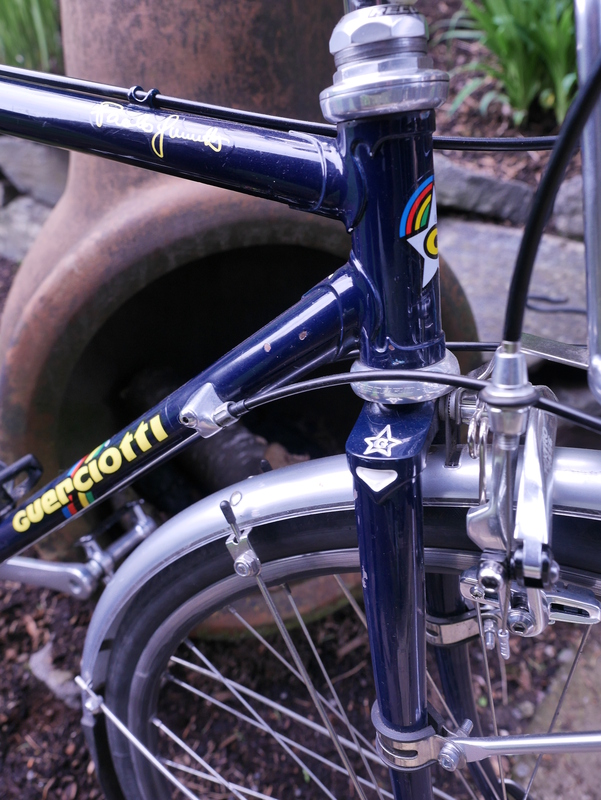 The seat stays are small diameter, and the fork crown and seat cluster feature beautiful engravings accented with white paint against the royal blue main color. I used Paul’s thumbies to bring the shifters up to the bar. The Tektro long reach brakes worked perfectly for this wheel size conversion (from 700c to 650c). 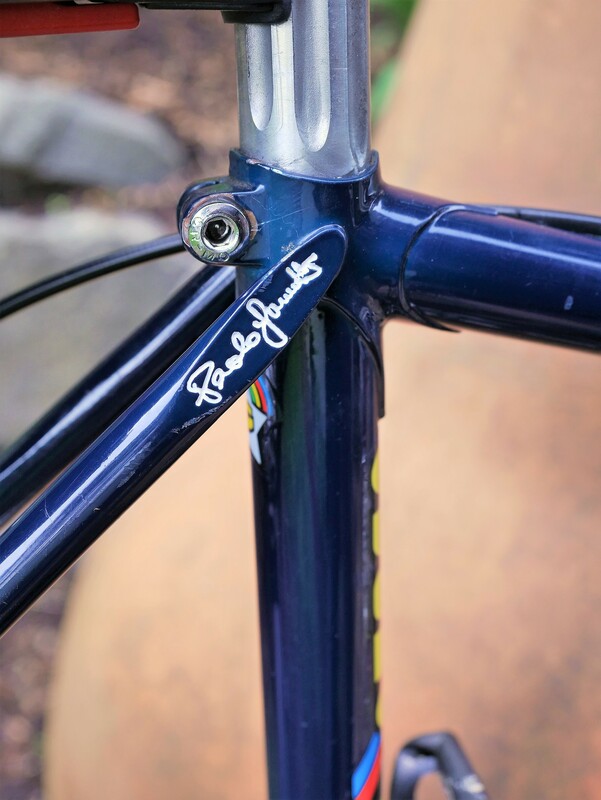 The frame had no eyelets or braze-ons for racks and fenders. So, I used zip ties to secure the fenders at the rear and p-clamps for the front fenders and front rack. 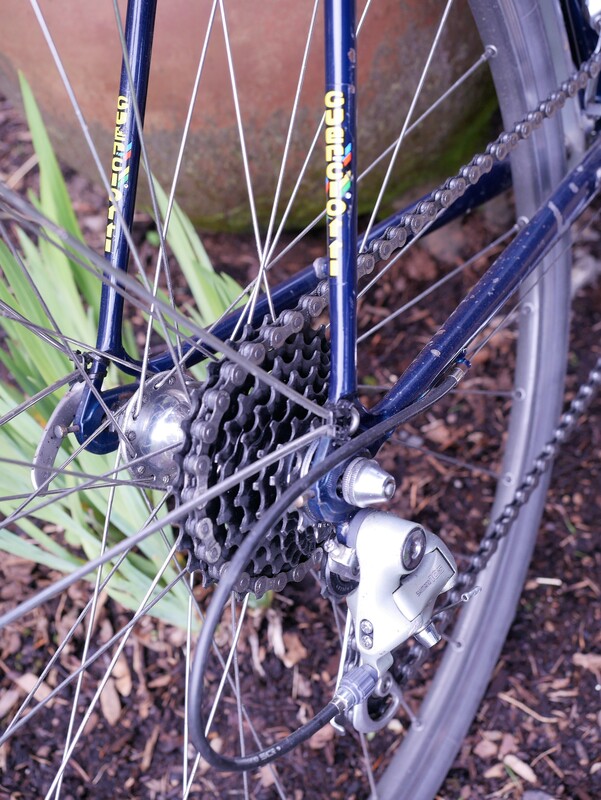 In keeping with its Italian heritage, I used a Campagnolo crankset, bottom bracket, and headset when building up the bike. The crankset’s arms are 170mm, and if I were to replace the crankset I would choose one with shorter arms as to address the low bottom bracket height after the conversion to 650c. After 5 years of use, all these modifications are still working perfectly – it is a delight to ride and handles beautifully. 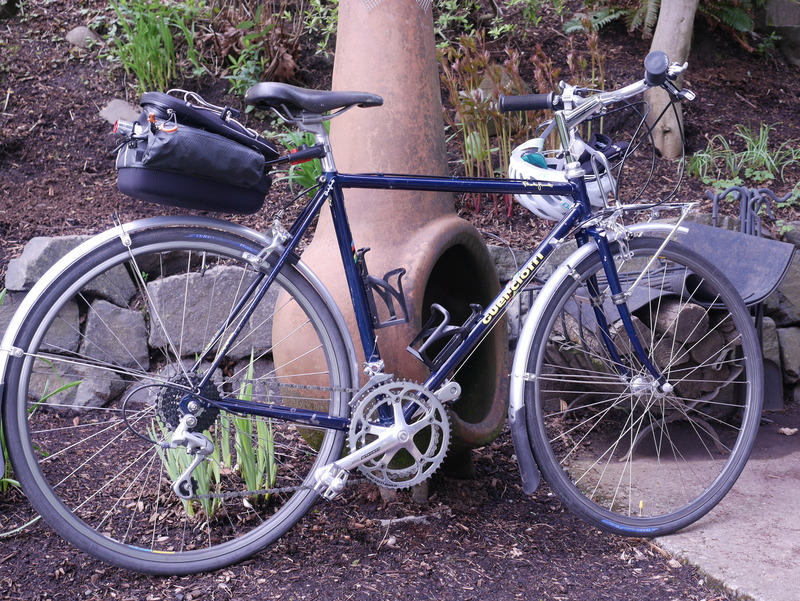 This entry was posted in Bicycle restoration, Vintage bicycle, vintage Camapagnolo, Vintage Italian Bicycle and tagged 650c conversion, Campagnolo, Guerciotti, Vintage Italian bicycle by Nola Wilken. Bookmark the permalink. Thanks, Joe. 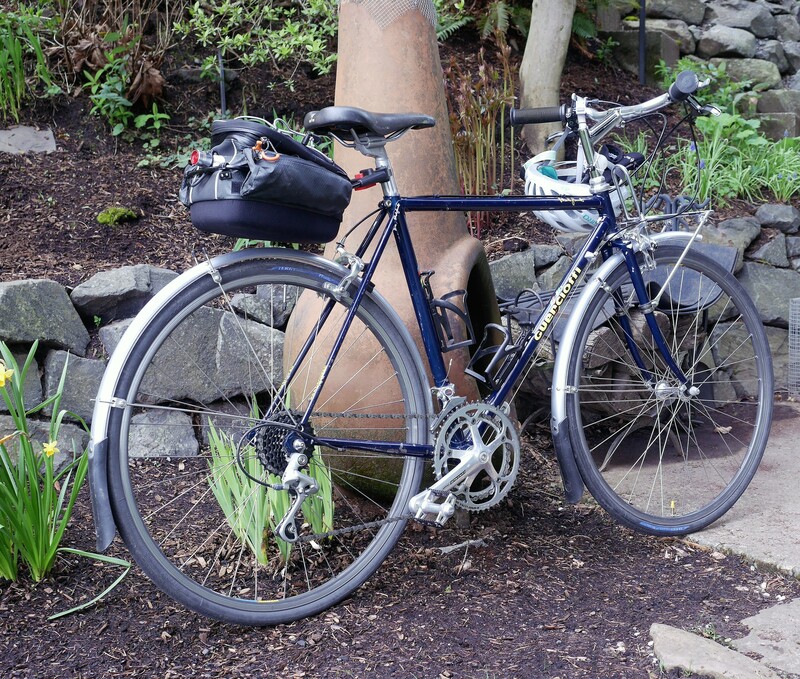 It can be difficult to convince the uninitiated that vintage steel bicycles offer a level of performance and comfort that will not be experienced on a new bike purchased from one’s LBS. We will keep trying, though. 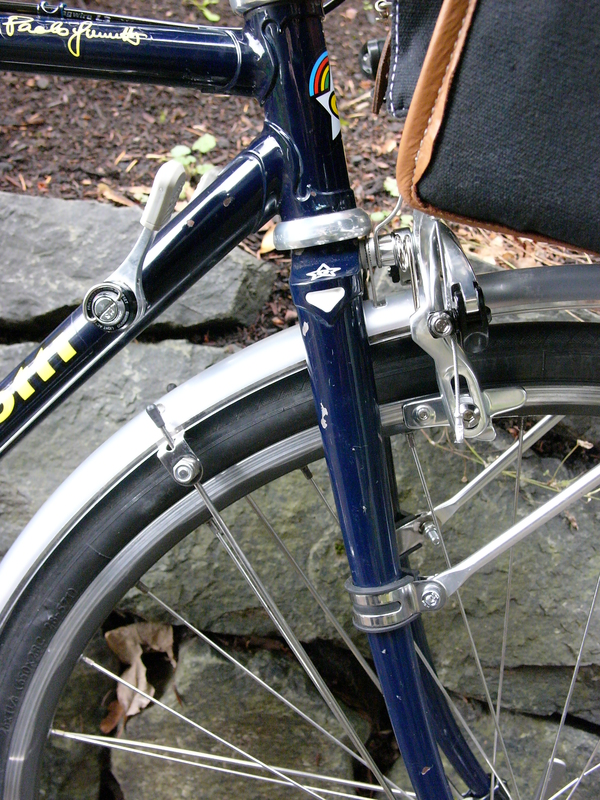 Those are probably the most classy looking P clamps I have seen on a bike, they just blend right into the frame. I am also jealous of your frames fork crown and seat cluster engravings, one of these days I am going to find a project bike/frame with that kind of detail. Nice ride! Campy made cranks as short as 150mm. No more clues as just your collection, not to mention your readers collections, could deplete the entire remaining world supply. And I am looking for one more set. Short legs have to make extreme angular motions to get a 170 crank around. 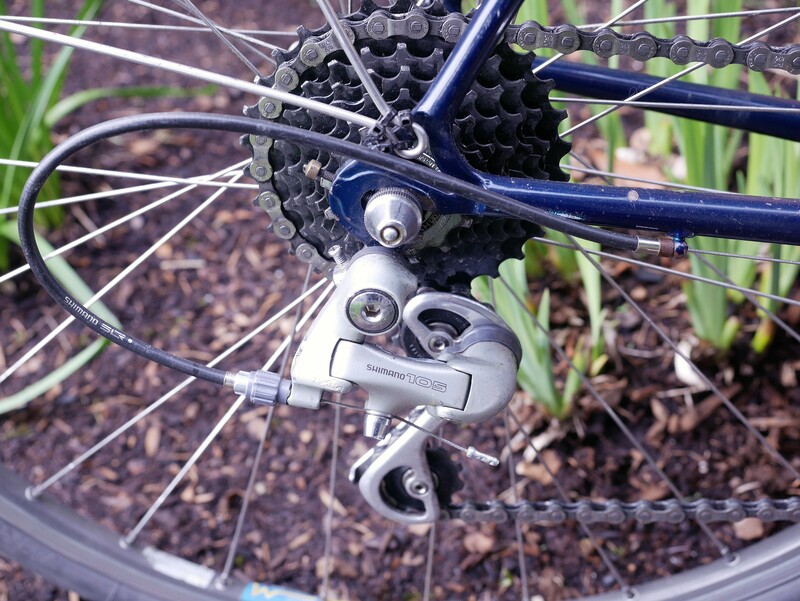 The standard spread of crank sizes is 165 to 175, or about a 6% spread. Leg lengths vary a lot more than that. Short people and tall people do completely different things when riding bike. The most common current production quality short crank is Sugino XD, made in 150, 152 (6 Anglophile inches) 155 and 160 as well as normal sizes. For domestic market there have been Alpina level versions of the short crank. Be careful of short cranks for BMX, they can be adapted to road bikes, you will need a mechanic who speaks both BMX and vintage. Besides solving many clearance problems I give it a 98% chance you would like the short crank so much you’d start converting the whole fleet. Unfortunately there do not seem to be many vintage short cranks out there except an occasional T.A. and lower quality juvenile steel cranks. Most will want to put the saddle up 3mm or so after a crank swap. No, you will not need lower gears. John, while it is seemingly obvious that longer cranks work better for taller cyclists, and vice versa, the research doesn’t bear this out. The 170mm length has been adopted as comfortable by drastically differently-sized cyclists. 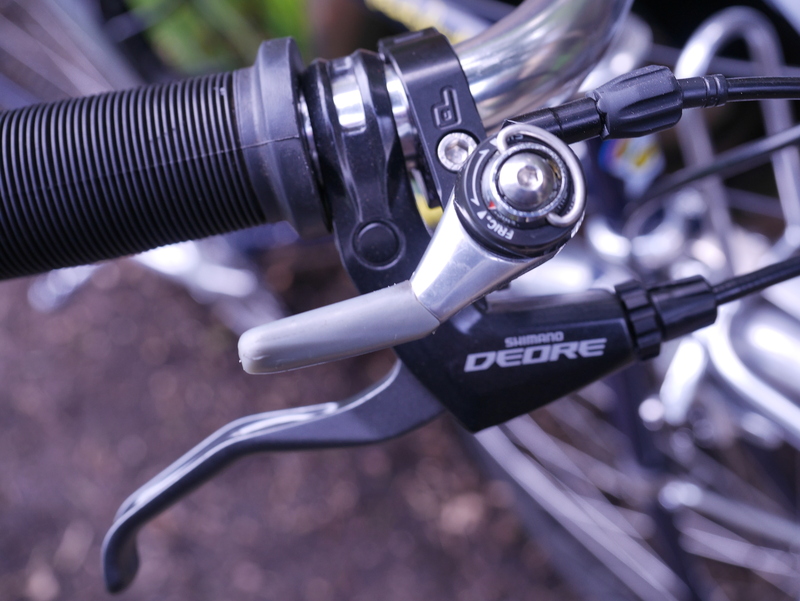 For example, shorter crankarms are used on track bikes to avoid pedal strikes and increase lean angle, but these short cranks are used by tall cyclists. 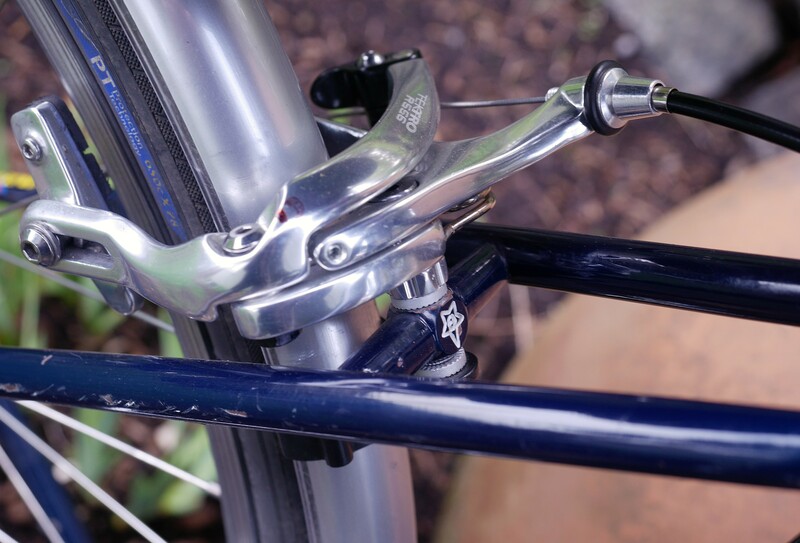 Ideal crank arm length may actually be more related the bicycle being used (bottom bracket height, toe overlap, and track use as the contributing factors). And, the position of the saddle will affect the rotation of the knee joint and legs. It’s a complex issue that even scientists who study this cannot agree on. I have found that riders should use a crank length that is both comfortable (providing a nice spin with no knee pain), and which addresses issues specific to the bike in question such as a low bottom bracket height and/or toe overlap. My Guerc would benefit from a shorter crank to avoid pedal strikes, yet I find the 170 mm length very comfortable for riding. It’s so beautiful!! I have some vintage bikes that are awesome but in such terrible cosmetic condition, I would love to have one in such beautiful condition. I am trying to decide if I should switch all my road bikes to smaller wheels, 650b or 650c. I mostly ride a bike with 700cc wheels. I put the Portland Design works road fenders on but even though they are advertised at max 23mm tires, the clearance is poor so recently switched to 20mm tires which is a bit much. I have a front rack with panniers on the special eyelet attachments which is probably a bit dodgy but it has been fine so far and this road bike actually will tolerate loads. 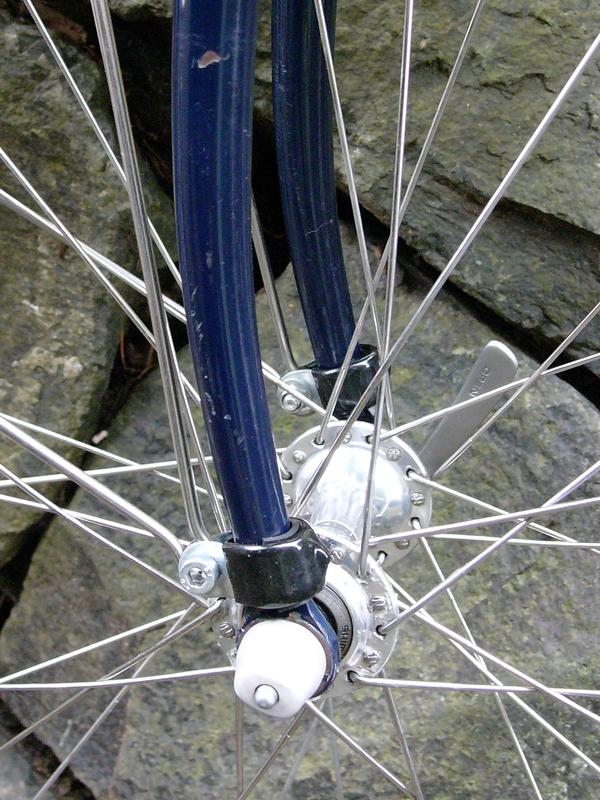 You can get the eyelet attachments from Velo Orange, Soma etc… They attach through the hub skewers, so are quite elegant. My attempts at P-clamps did not do well. As for shorter cranks, alas my husband may have ruined my TA specialties 160mm cranks when trying to get them off the bike as there was a major bottom bracket issue. The crank is stuck to the bottom bracket in a bag, he took the chainrings off. I need to get the TA crank remover. 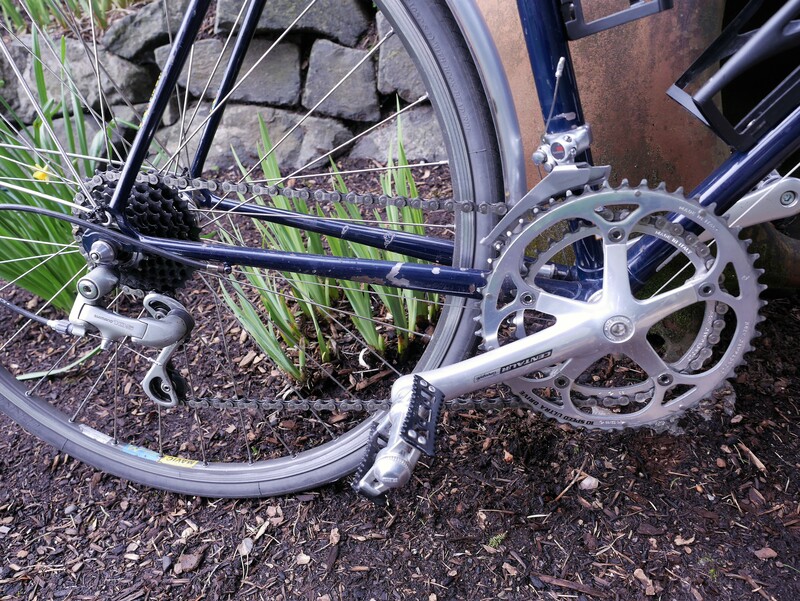 He put a 175mm crank arm crankset on from the parts bin and it is TERRIBLE. I noticed it is taking me much longer to get to work and have been late a few times because it demonstrates exactly why shorter people need appropriately sized components. The toe overlap oh my! I have no momentum, there is all this dead space when the bike is going fast and there is no need to pedal because I’d just be spinning. It reminds me how I spent so many years riding an assuming I was just a terrible rider, when I just needed the right sized cranks. With the 160mm cranks it was so efficient, always pedalling with lots of power and momentum. But they are not easy to find, or expensive and have to be ordered from Japan. Hi Heather, I think crank length involves several considerations. Comfort being the first. 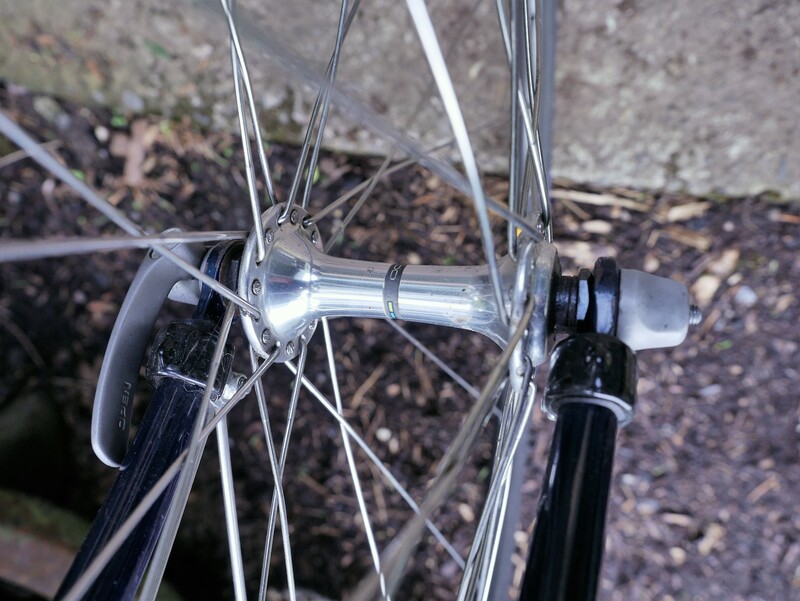 Cyclists should try out different lengths to determine what works best, while at the same time understanding that shorter cranks may be necessary on certain bicycles with toe overlap and/or low bottom brackets. Could I ask please if you’d added anything to protect the metal exposed by the chipped paint to keep it going for so long? I’m trying to respore an old raleigh trent tourist and there’s a fair bit of rust that needs treating but after using rust remover I wouldn’t then want to paint over any of it. I treat small chipped areas first with fine grit sandpaper of no less than 600 to remove the rust without scratching the frame. Once that is done I use clear Testors paint to protect the bare steel. That way I can watch the area to be sure no further rust damage is happening.